This template is similar to the template Kleen. I just changed the header image from the Header Edit button, and changed all the fonts and colors from the Fonts and Colors in the Layout page just to show that you can customize a lot even without tweaking with the HTML code. Note: Remember to upload a header image with 950 by 150 pixel size and fill up the Linkbar when you use the template. Otherwise, your Header will be cut off. Thank you so much for sharing your secrets. I would like to plug your blog on CoolAdzine for Marketers if its okay. You do not know how many people are out there going, "How in the world...?" Leave me a comment if its okay to give you some publicity. Thanks cybercelt for your comment. It's great that you want to share my blog at CoolAdzine for Marketers, which is entirely okay with me. 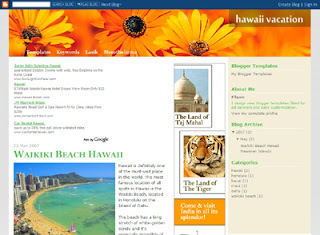 I do plan to add guide posts to explain about the blogger template with pictures to help visualize and how to customize them so people can learn to do the templates by themselves. i think it's because the 'content-wrapper' width is smaller than what it contains (for that pc). if this is the case, what you need to do is add a few more pixels to the width of content-wrapper. And if you do that, you have to add the same amount of pixel to the body width, outer-wrapper, header-wrapper, and footer-wrapper. Does this sound doable? Hey, thanks for sharing this template. I installed it on my blog, having gotten tired of using calibri, which looked horrid in IE. I'm not using the center column yet, as I think it looks a lot cleaner with only two, but am glad the option is there. Thanks again. So far so good. The only problem appears when I want to wrap my adsense next to the post (say, to the left). The surrounding text did not succesfully wrap the adsense, but both adsense and the text were as if standing at 2 different columns inside the body post. I was wondering if you had this experience before. If you did, I would be grateful if you could let me know why. If you didnt get what I meant, I can send you the screenshot of the above mentioned problem. julianto, can you send me the snapshot? Can I know your email add so I can send you the screenshot?